He stood at the intersection of time, a man of many nations, and a man whose leadership lessons resonate through the ages. His name was Thayendanegea but we know him better as Joseph Brant. Thayendanegea was born the son of a Mohawk chief in present day Ohio in the 1740s when his people where still seen by the French, British, and American colonists as allies and trading partners. However, those days were ending. The Seven Years War, called the French Indian War in the United States, was a world war. It swept across the Atlantic and saw aboriginal nations choose between the French and British. Thayendanegea was in the thick of it all. His family had moved to what is now upper New York state. Powerful and wealthy British diplomat William Johnson had married his sister Molly. Johnson had taken note of Thayendanegea’s intellect and leadership qualities. After assuming the English name Joseph Brant, he enrolled in a Connecticut school where he perfected English and learned Latin, Mathematics, History, and more. With growing talk of war, Johnson arranged for Brant to join the British army. At age 15, he fought in the 1758 expedition that ended with the horrific Battle of Carillon. He was promoted to captain after leading men at the 1759 Battle of Fort Niagara. In 1760, he led Mohawk men in the 1760 siege of Montreal that saw the city fall to British and Mohawk forces and, with that defeat, the French empire leave North America. Brant was one of 181 Native American soldiers honoured with Britain’s Silver Medal. Britain had won but demanded that its American colonists help pay for the war with a series of taxes and that they remain east of a line drawn to protect Native land. As tensions grew, Brant was again that the center of it all. He had become an influential leader in the six-member Iroquois League, formed to present a united aboriginal front. With growing violence demonstrating that the British and colonists were headed for war, the League convened in August 1775. The League was broken. 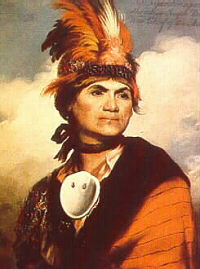 Four of the six nations decided to back Britain, including the Mohawks, now led by Chief Joseph Brant. With the revolutionary war causing more intrusions into Mohawk land and Britain asking for more aboriginal help, in 1777 Brant and Johnson’s successor Guy Johnson traveled to London. Brant met with political leaders, members of the artistic and academic community, and twice with King George III. He spoke articulately and in his perfect English of the advantage to Britain of a full alliance with the Mohawk nation. He left with the promise that his efforts in the war would be rewarded with protection and land grants. Brant was good to his word. He rallied a substantial force of Mohawk soldiers and for the next two years led them in a number of operations and battles. He and his men fought with the British at Fort Oswego, at the Siege of Fort Stanwix, and the Battle of Oriskany. The war became vicious with both sides destroying livestock, poisoning wells, burning farms, homes and towns, and slaughtering civilians. In November 1778, Brant led 300 Mohawks on a raid along with 150 British Rangers led by Captain Walter Butler that resulted 30 civilian deaths in Cherry Valley. General George Washington reacted by ordering an expedition that resulted in the destruction of over 40 Iroquois villages and the murder of countless women, children, and old people. Brant gathered his people and soldiers and, after consultation with British generals, moved in April 1781 to Fort Detroit. He was victorious in a number of battles against American troops but conditions grew harsh, British provisions stopped, and on the Atlantic coast, Britain suffered its final defeats. With the Revolutionary War’s conclusion, Brant and his Mohawk people were left without land, economy, or friends. The 1784 Treaty of Fort Stanwix saw the new American government take control of what had been aboriginal land. Meanwhile, newspapers branded a number of Native leaders who had fought with the British as war criminals. Brant was personally cursed as a monster with actions he and his men had taken exaggerated while similar actions by American armies were swept from official accounts and popular memory. Brant returned to England where he again met with King George III. He was promised a personal pension with vague pledges of land. With a new American war against aboriginal people spilling more blood and more burning towns, Brant met with Quebec Governor Lord Dorchester and then with President Washington. Despite his efforts he could not negotiate an end to the American – Indian war or secure land for his people. The 1794 Battle of Fallen Timbers led to a number of aboriginal nations signing a treaty that ceded scraps of land for a tenuous peace. Like Shawnee war leader Tecumseh, Brant refused to surrender and sign. Brant gave up on the Americans. He dealt with the British and, with the assistance of Upper Canada Governor John Graves Simcoe, secured a large land grant along the Grand River that flowed north from Lake Erie in what is now Ontario. Brant moved the remnants of his Six Nations people to the fertile valley and together they developed the area while affording protection against a possible American invasion across the border at Niagara. Roads and towns were built and farms thrived. Brant bought an additional 3,500 acres from the Mississauga nation at the western tip of Lake Ontario at Burlington Bay. He built a fine house on a cliff that afforded him a stunning vista over the lake. He lived in peace and until his death in November 1807. Today, memory of Brant has been washed from America but Ontario has the city of Brantford, Burlington’s main street is Brant Street and its hospital is Joseph Brant Memorial. He is remembered as a diplomat, military leader, and a fierce defender of the dignity and rights of his people. The Iroquois confederation he helped form is remembered as an inspiration not only for Tecumseh but also for American and, later, Canadian leaders who admired its democratic nature and federal political structure. Brant and his struggles should be recalled when those living along the Grand River and elsewhere in Canada and the United States are reminded from time to time that their homes may well rest on Native land. ← Why Do We Watch Sports or Why Am I Here? I read your interesting column on Joseph Brant hoping you would connect him to the fine Mohawk English writer, poet, and entertainer from Brantford, Pauline Johnson. From Wikipedia. In 1886, Johnson was commissioned to write a poem to mark the unveiling in Brantford of a statue honoring Joseph Brant, the important Mohawk leader who was allied with the British during and after the American Revolutionary War. Her “Ode to Brant” was read at a 13 October ceremony before “the largest crowd the little city had ever seen.” It called for brotherhood between Native and white Canadians under British imperial authority (Gray 2002, p. 90). The poem sparked a long article in the Toronto Globe, and increased interest in Johnson’s poetry and heritage. The Brantford businessman William F. Cockshutt read the poem at the ceremony, as Johnson was reportedly too shy.